Buying vintage jewelry is one of my absolute favorite things to do, especially when I travel. To me, there's nothing like a one-of-a-kind piece of vintage jewelry to commemorate a trip. Finding vintage treasures in a tucked-away vintage shop (like the one I found in Rome) is part of the joy of traveling. After decades of buying vintage jewelry, I've learned a few helpful tips for buying vintage jewelry that you can use to start your collection. Especially when it comes to sterling silver, weight matters. A good hand-feel is one of the most critical tips for finding genuine sterling pieces of jewelry. Next time your shopping for vintage jewelry, pick up a piece of costume jewelry in one hand and a vintage piece of jewelry sterling in the other. You'll probably notice the difference. Always insist on holding and trying on every piece that I buy. If it doesn't feel substantial, that's a red flag. Obviously, this may not apply to small pieces like pendants or pins, but larger necklaces and bracelets should feel heavier. 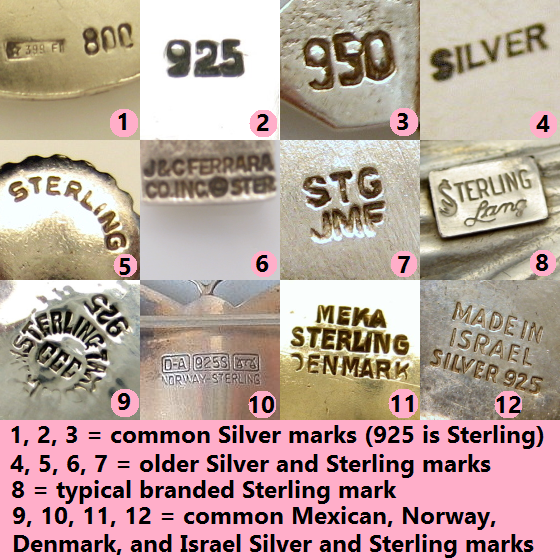 Markings are one of the first things I look for on any piece of jewelry. While they may not be as popular today, markings were extremely popular in the 19th & early 20th century. Jewelry with metal markings or markings of a specific jeweler can signify that you've got a quality piece of vintage jewelry. I always look for markings on any piece that I'm considering buying. Even your typical metal markings (925 or 14kt) are a great way to validate your hunch about a piece. A good vintage store especially one that specializes in vintage jewelry should have knowledgeable staff. If you have questions about the provenance of a piece (where it came from or how long they've had it), you should ask! Often, you'll find out unique and interesting facts about the piece of jewelry that you're interested in, which might convince you to buy it. If you ask questions and the shop manager/owner doesn't know, that doesn't mean it isn't authentic. It could signal that the shop doesn't specialize in jewelry, which can sometimes work out in your favor. Always look around to see the other items available in the shop. If all you see is a small display of jewelry, then you can probably guess jewelry isn't their specialty. Sometimes you can find a one-of-a-kind piece of jewelry the store doesn't even know is valuable. That's precisely what happened to me in a small shop in San Francisco. They specialized in costume jewelry, but I found a 19th-century Victorian ring that the shop owner had no idea was even worth anything. I got it for next to nothing! Once I realized how valuable it was, I stopped asking questions and got my credit card out to close the deal quickly. Price is not always a sign that your piece of unusual or even authentic. Many shops, especially those in highly touristy areas, will mark up an item just for profit. Never assume that an expensive item is valuable. Always ask for the shop owners best price, which will let you know if the door is open for negotiation. If they're willing to haggle, they'll counter back with a price lower than the ticketed amount. You decide if that price is good enough or if you want to negotiate lower. You should be prepared to counter back with the lowest price you're willing to pay. But remember to be respectful of their business, meaning never insult them with a super low price. If you're seriously interested in a piece, spend some time looking carefully at the quality of the item. You should make sure there are no chips, missing stones, or visible damage. If you look closely, you may find damage. A good jewelry store will always have a magnifying glass for you to look more carefully. And while the piece may have blemishes, you may find it doesn't matter. Knowing about the damage can help you negotiate a discount. One of the best tips for buying vintage jewelry is to carry cash. Some shop owners would prefer cash to a credit-card transaction. It's always worth asking for the best cash price on a piece. This lets the shop owner know you're flexible with your method of payment. While it may not make a huge difference, $5-10 can add up over time. I'm a real sucker for the musty vintage shops. You know, the ones bursting at the seams with various odds and ends. But vintage stores aren't always the best places to find vintage jewelry. Flea market's, traveling vintage shows, and estate sales are all places to find quality vintage jewelry. I've also done my fair share of eBay shopping, but I find eBay can be quite addictive. There's something about the rush of betting that can be dangerous, at least for me. Etsy and Ruby Lane are good alternatives to eBay. Etsy is home to tons of quality vintage pieces without the hassle (or danger) of bidding. Ruby Lane is an even better alternative. It's probably my favorite place to find quality vintage. It's like eBay married Etsy. You get select your best offer or pay the fixed price. Ruby Lane specializes in quality vintage of all types from housewares to furniture to jewelry. Some of my all-time favorite pieces have come from Ruby Lane. I've learned over the years to follow my gut when it comes to purchasing vintage jewelry. When I see something that I love, I usually know it instantly. There've been times when I have spotted a piece through a window or across the room and fell head-over-heels in love. When you know, you just know. Usually, if I have a strong feeling about a piece I'll find a way to buy it or place it on layaway. I'd rather have it than regret letting it slip by me.